Despite their love for each other, Mi-ja and Young-sook’s differences are impossible to ignore. 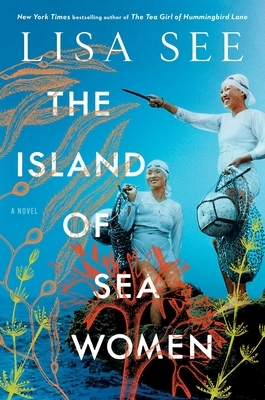 The Island of Sea Women is an epoch set over many decades, beginning during a period of Japanese colonialism in the 1930s and 1940s, followed by World War II, the Korean War and its aftermath, through the era of cell phones and wet suits for the women divers. Throughout this time, the residents of Jeju find themselves caught between warring empires. Mi-ja is the daughter of a Japanese collaborator, and she will forever be marked by this association. Young-sook was born into a long line of haenyeo and will inherit her mother’s position leading the divers in their village. Little do the two friends know that after surviving hundreds of dives and developing the closest of bonds, forces outside their control will push their friendship to the breaking point. This beautiful, thoughtful novel illuminates a world turned upside down, one where the women are in charge, engaging in dangerous physical work, and the men take care of the children. A classic Lisa See story—one of women’s friendships and the larger forces that shape them—The Island of Sea Women introduces readers to the fierce and unforgettable female divers of Jeju Island and the dramatic history that shaped their lives. Lisa See is the New York Times bestselling author of The Island of Sea Women, The Tea Girl of Hummingbird Lane, Snow Flower and the Secret Fan, Peony in Love, Shanghai Girls, China Dolls, and Dreams of Joy, which debuted at #1. She is also the author of On Gold Mountain, which tells the story of her Chinese American family’s settlement in Los Angeles. See was the recipient of the Golden Spike Award from the Chinese Historical Association of Southern California and the History Maker’s Award from the Chinese American Museum. She was also named National Woman of the Year by the Organization of Chinese American Women. “Vivid ... thoughtful and empathetic ... necessary." "Compelling ... takes readers on a journey spanning generations — in this case 1938 to 2008 — as moments of cherished friendship, unspeakable tragedy and, in the end, a plot twist worthy of Raymond Chandler unfold." "Lisa See is a New York Times bestselling author, a thorough researcher and a wonderful storyteller. In this novel, she seamlessly weaves history, tradition and culture into a heartfelt story about love and forgiveness. It’s an unforgettable read." "I fell in love with the writing of bestselling and award-winning author Lisa See more than 10 years ago ... This novel introduces readers to the unforgettable female divers of Jeju Island and the dramatic history that shaped their lives." "The most intriguing parts of the book are those that describe the lives of the haenyeo ... See reveals how perilous the work can be: One diver is almost killed by an octopus, and another drowns because of an abalone. Yet the women love the sense of freedom, competence and strength they find in the water." "Fascinating ... Readers will witness the fortitude of these women to transcend tragedy and find forgiveness." "In this bittersweet novel that spans more than 50 years, Lisa See tells the story of Mi-ja and Young-sook, two best friends who live in a kind of feminist utopia on a Korean island." "For centuries on the Korean island of Jeju, Haenyeo women were trained to expand their lungs and go diving on the ocean floor to harvest seafood ... Mi-ja and Young-sook are best friends and Haenyeo divers, set to follow in their mothers' footsteps. But as they come of age during a tumultuous period in Korea's history, certain deep-rooted differences may tear them apart." "This beautiful story follows Mi-ja and Young-sook, friends from very different backgrounds who are members of an all-female diving group in Korea. Really, though, the book is about the endurance of friendship when it's pushed to its limits, and you (+ your BFF, when you lend it to her) will love it." "I was spellbound the moment I entered the vivid and little-known world of the diving women of Jeju. Set amid sweeping historical events, The Island of Sea Women is the extraordinary story of Young-sook and Mi-ja, of women’s daring, heartbreak, strength, and forgiveness. No one writes about female friendship, the dark and the light of it, with more insight and depth than Lisa See." "I loved The Island of Sea Women from the very first page. Lisa See has created an enthralling, compelling portrait of a unique culture and a turbulent time in history, but what's really remarkable about this novel is the characters—two women whose lifelong friendship is tested during impossibly difficult times. Compelling, heart-wrenching, and beautifully written, The Island of Sea Women will plunge you into a world and a story you've never read before and remind you how powerful women can and must be to survive."